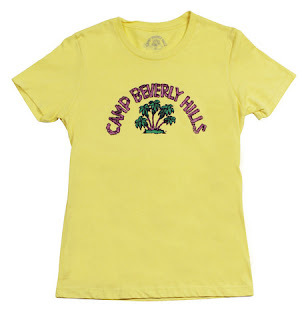 As a young girl growing up in the 1980s, you had to own something from Camp Beverly Hills. Unfortunately, as you know, I was a bit of a chubster and their shirts were too small for me. However, I did own Camp Beverly Hills slouchy socks. Back in the 80s, Camp Beverly Hills was everywhere. Even teen stars like Drew Barrymore wore the brand! The cool California brand had been around since 1977, but became all the rage in the mid 1980s. Right now, there's an original Camp Beverly Hills t-shirt on eBay going for $107. Wow! 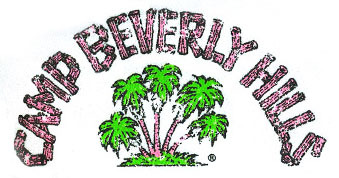 Camp Beverly Hills recently relaunched and came back from retirement. The stylish, fresh, young brand is satisfying the nostalgia crazed kids of today, for sure. Shirts, hoodies and more can be purchased from campbeverlyhills.com or in upscale department stores. Labels: 1980s clothing, 80s fashions, camp beverly hills, retro clothing, vintage clothing. At around age nine, I discovered a TV show my fellow classmates knew nothing about. Every Saturday night, after my scheduled bedtime, I would tiptoe down to the den and watch Saturday Night Live. I first discovered the show at my friend Dawn's house. Dawn lived with her dad and he didn't care what we did. I'd sleep at her house on Friday or Saturday nights. We'd build blanket forts and stay up late watching Saturday Night Live every weekend. For some reason, I thought the late Gilda Radner was hysterical as Roseanne Roseannadanna. Her crazy-haired fictitious character was notoriously loud and obnoxious. Roseanne Roseannadanna would read hilarious "Dear Abby" style letters during SNL's Weekend Update skits. I'm quite sure I was watching this in the 1980s. Maybe NBC ran repeats of the late 1970 episodes. I can't recall. Feel free to enlighten me with a comment if you remember. Here is a sample clip of Gilda Radner as Roseanne Roseannadanna on Saturday Night Live back in the late 1970s. Tonight I came up with a great idea for a unique Saturday night date with my husband. I told him I'd like us to build a blanket fort in the living room. We could snuggle up and watch a movie inside. We could pretend we're having a sleepover. Nestled in our cozy blanket fort, we could drink icy cold Cokes and feast on Doritos and Hostess like we did when we were 9. Back then diets didn't exist. I asked if he remembered blanket forts. He did. I asked if he liked my idea, he replied, "What the heck do I want to do that for? The tile floor will hurt my knees." I'm bummed he didn't like my idea. I even suggested that we lay a thick comforter on the floor. No go. I miss blanket forts. As a kid, I loved using sheets, blankets, comforters and pillows to create an amazing fortress. I'd drag my favorite dolls and books inside. 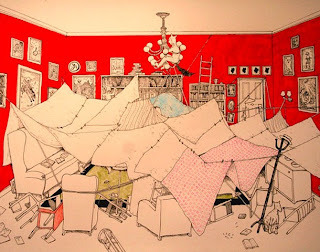 There was a time when I felt so safe under the roof of a homemade living room fort. It was heaven. It was all mine. One day, I will revisit the blanket fort. I simply refuse to abandon the idea. Did you build forts out of blankets and sheets as a kid? There were many popular styles of sunglasses back in the 1980s. The summer of Karate Kid, I was all about plastic, slotted sunglasses that resembled blinds or shutters. However, there was a time when everyone loved these cool fold-up or folding sunglasses. They may have come in brown, but I only recall black. These cute folding sunglasses came with a small leather or fake leather case. The Aviator style sunglasses would easily fold up and fit into the case. Ferarri was the brand kids loved best. They were so cool. Once folded and zipped into the little case, the sunglasses fit into my purse or pocket with ease. 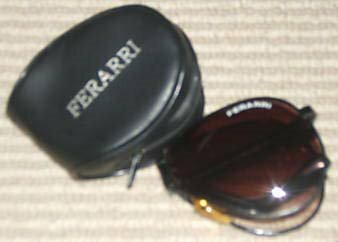 Remember Ferarri folding sunglasses from the 80s? were nominated for Golden Globes. In 1985, I was touched by the movie, Mask. Based on a true story, Mask focused around Rocky Dennis (Eric Stoltz), a teen living with a rare skull deformity. His life was far from easy. His mom, Rusty (Cher) was a wild biker babe who loved her son and only wanted the best for him. Rocky dealt with teasing, but used his humor and intelligence to win friends. Rocky was the best son in the world. He was a top scholar. He tutored kids at school. He helped break his mom from her drug habit. He wrote award-winning poetry. He worked at a summer camp for blind children. He was a great friend and amazing boyfriend to Diana (Laura Dern). The movie takes a sad turn when Rocky suffers from extreme headaches one night and passes in his sleep. There was something about the movie Mask that most '80s kids will always remember. Maybe it was the shock of seeing a fellow teen suffering from such a freakish disease? Maybe it was the reality factor of knowing Mask was based upon a true story? Do you remember Mask? View the Mask trailer here. 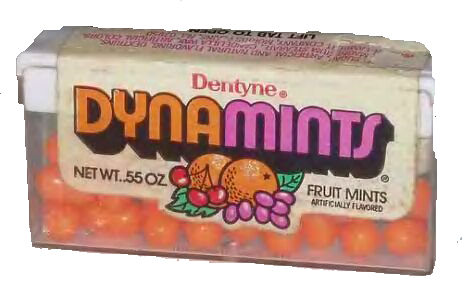 What better way to lose weight in the 1970s and early 1980s than with chocolate, caramel or peanut butter flavored candies? Ayds was just that. Each tasty candy-like bite contained a special appetite suppressant to keep dieters from cheating. Enter the AIDs crisis. Admit it. When you hear the word "Ayds" (pronounced Aids), the immune disease is the first thing that comes to mind. This very thought helped sales drop 50 percent by 1988. Unfortunately, even changing the name to Diet Ayds didn't save this gimmicky diet product. Do you remember Ayds? 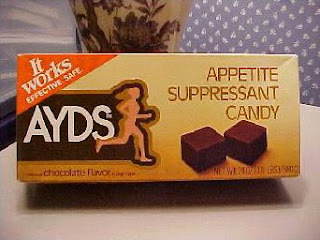 Here's a commercial for the appetite suppressant candy. 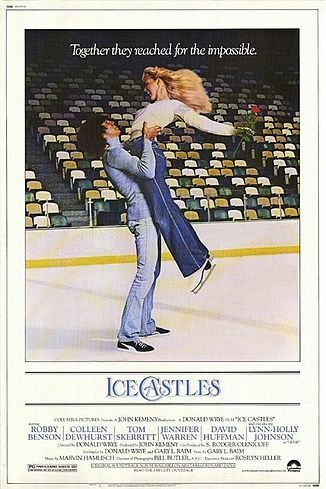 How much did you love Ice Castles in the early 1980s? The movie first opened in 1978, but I was too young to see it in theaters. I'm guessing I must have caught it on TV because I do remember it. What little girl in the late '70s/early '80s didn't enjoy Ice Castles? Everything about this movie was beautiful. The lead actors. The story line. The theme song, "Through The Eyes of Love" preformed by Melissa Manchester. I remember "Through the Eyes of Love" was popular at dance recitals, weddings and couples skates in the early 1980s. 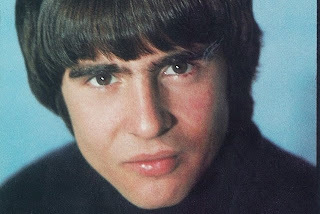 It was impossible not to adore Robby Benson as Nick. Through his tough love style, he inspires Lexie (Lynn-Holly Johnson), a talented ice skating star blinded in a tragic accident, never to give up. He sticks by her side throughout her best and worst times. View a clip of the original Ice Castles from 1978.